Gotham Steel Knives Reviews - Is it a Scam or Legit? Made with super strong titanium, Gotham Steel Knives will help you cut your food with ease—everything from tomatoes to steaks—and will remain sharp for life. Gotham Steel Knives feature a super strong titanium blade that will help you cut and slice your food with precision and ease. They’ll even last a lifetime. On top of their durability, Gotham Steel Knives’ blade runs through the wooden handle for more support and durability, in addition to holes that allow your food to fall right off. Knife sets are a staple within the ASOTV industry, and have been sold through infomercials almost from the beginning. But when it comes to Gotham Steel Knives, is there anything that makes them meaningfully different? Can you find something similar (and less expensive) locally? We’re here to answer all your questions, so let’s begin by talking about titanium. Is Titanium a Good Knife Material? Titanium is a chemical element (Ti on the Periodic Table) that’s used in a variety of materials, including everything from sunscreen to kitchenware and cutlery. Despite its widespread use though, titanium is a relatively soft metal and isn’t considered ideal for cutlery, since it has a tendency to dull quickly. To get around this, most manufacturers create a blend (alloy) of titanium and steel in order to improve the edge resistance. Now, a knife’s overall quality depends on the grade of steel and titanium inside, as well as the specific blend of these two metals. Unfortunately, this information isn’t provided by Gotham Steel Knives’ manufacturer, so it’s impossible to gauge its relative quality. Long story short? Yes, titanium is strong (i.e. it won’t break easily), but unless it’s blended with high-quality steel in the right proportion, your knives could dull quickly. Titanium is only a marginally acceptable metal for a knife blade. It cannot be hardened much past the mid 40's of the Rockwell C scale, and that's spring, or throwing knife territory. Aside from that, I'm sure that there will soon be collectible titanium knives on many custom makers tables, designed to catch collectors, and not for cutting. Although this might be the case, titanium is still a popular choice for a wide variety of cutlery. How do Gotham Steel Knives compare? How Do Gotham Steel Knives Stack Up To the Competition? If you search online for “titanium knives” or “titanium cutlery,” you’ll quickly learn that you literally have tens of thousands of options to choose from. And when you’re browsing through these results, you’ll notice that most brick-and-mortar retailers stock several options as well. Need even more of a reason to check out all your options? While you can certainly pay hundreds for a titanium knife, you’ll find that the majority of your choices are about the same price as Gotham Steel Knives. How much are they, exactly? One Gotham Steel Knife is priced at $19.99 plus $6.95 S&H. During checkout, you’ll also be able to purchase a set of four steak knives for an additional $4.95 S&H. All Gotham Steel Knives come with a 30-day refund policy, less S&H charges. To put this into perspective, if you chose the bonus knives and decided to process a return, you could lose almost as much in S&H charges as you’ll get back as a refund! Gotham Steel Knives also come with a lifetime guarantee: If they ever dull, the company will replace them for free. In order to request a refund, you’ll need to call Spark Innovators’ customer service at 855-721-3347. We’ll talk more about the company in just a second, but before we do, it’s important to mention Gotham Steel Knives’ arbitration agreement. Watch Out for that Arbitration! As soon as you place your order for Gotham Steel Knives, you’ll be bound by an arbitration agreement. What’s this mean? Among other things, this means if you experience damages from Gotham Steel Knives (whether physical or financial), you wouldn’t be able to take the company to court, or join a class action lawsuit related to the cutlery. Spark Innovator’s is a middle-of-the-pack company within the ASOTV industry, who makes dozens of popular products, including InVinceable, Underlight Accent Lighting, Gotham Steel Pans, Engrave-It Pro, and many more. Among well over 100 HighYa reader reviews for these products, they had an average rating of 1.5 stars. Why? Common complaints appeared to involve products that didn’t work as advertised or were poor quality, and difficult customer service experiences. Despite this, Spark Innovators had an A+ rating with the Better Business Bureau (as of 11/2/15), based on only seven closed complaints. Many of these referenced the same concerns above. Should You Roll the Dice On Gotham Steel Knives? Titanium is a popular knife material. But because it wears easily, you can quickly experience dullness if it’s featured in the wrong areas (such as the blade edge). Because it’s popular, you’ll find thousands of other titanium-infused knifes, both online and off. Many of these options will be about the same price as Gotham Steel Knives, especially when you factor in the steep S&H charges. During our research, one thing we didn’t encounter many blades filled with holes, like Gotham Steel Knives. Sure, the manufacturer claims that you can cut some things easier (such as cheese—no jokes!). But in reality, they’re largely just for show or to cut down on weight, and can even weaken the blade in some instances. Where does this leave you? We’d recommend checking local options for titanium-infused knives before ordering Gotham Steel Knives. At the very least, this could save you money in lost S&H charges if you end up dissatisfied! I am utterly shocked at just how poorly these knives cut after being used two or three times. They show up in a nice box, they look like the could be high quality, then you find out it's all smoke and mirrors. Folks, don't waste a penny on these knives, you'll surely be disappointed. I ordered in late October (the 7" Santoku knife with a bonus paring knife for only $5.95 extra, and a 9-piece knife set). I received a postcard in mid-November stating that the knives are delayed and to send the postcard in if I wished to cancel the order. Then on December 2nd, I receive a postcard stating that if they don't hear from me by December 14th, the order will be canceled. On December 12th, I receive an email stating that the order has shipped. I receive my 7" Santoku and paring knives, but there was no sign of the 9-piece set with bonus storage. I contacted the customer service number, which gets me a representative who tells me that I have experienced a global cancellation on the 9-piece set, which means they don't make it anymore. So I asked to speak to someone in charge, as this customer service number is only for shipping! I contacted the new number which lists every "cheapo" product advertised on TV, but conveniently doesn't mention the Gotham Steel products! And it kicks me out if I don't select one of the four products. What a scam. Reading the others reviews confirms what I was afraid of, it's a scam. I couldn't order them online as it couldn't find my address (that was my first warning sign) so I called to order and never got a receipt emailed to me. Now it's weeks later and I call back and they have no record of my order. I'm going to have to cancel my card I used so they don't scam me. I ordered my order on 9/10/16 and still have not received my order. Upon calling today, not only was the customer service rep discourteous but then informed me that they canceled the 6 piece knife set today (discontinued). I told her that the knife set was part of the reason for the order in the first place. She then wanted to cancel my order. I explained I wanted my order that was promised to me within 2-3 weeks. 5 weeks later still nothing regarding my order and part of it canceled. She told me that when it comes in the warehouse I will be sent my order. Yeah, thanks. So I purchased the Gotham knife and the Gotham mini over a month ago and have yet to receive them. I called customer service who advised me they are on back order and can not tell me when I will receive my knives. I would not recommend this experience. You're better off going to a local big box store and buying my knives. Customer service is a joke and seemed like she obviously did not care. 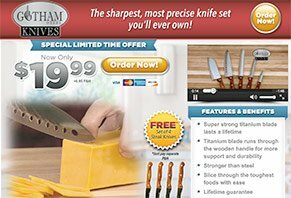 I had ordered a set of Gotham Steel Knives seeing an ad on TV in November 2015. I called a month later only to be told that the order was on back-order and will be shipped soon. I called again after a couple of months and I was told it is still on back-order and my order was cancelled (just like that). What the hell. If the intention was not to fulfill the order, why even take the order. Ridiculous. I strongly feel it is a scam. I canceled the credit card I used to buy this product just in case they don't misuse it at a later stage. This company is a bogus. I've never been able to try the knives. Looked like a good commercial, so I placed an order. I got my receipt via email, with instructions to check www.customerstatus.com regarding delivery between 24-48 hours later. So a week later I check. The website can't find any record of my order. I try various methods wasting an hour with no progress. A week later still no record, so I call their number 1-855-721-3353 but there is no answer there. Next day I try again, and the recording says they're open, I wait for a customer service rep, and the line goes dead (they hung up). So I call back, wait because they're busy, and finally talk to Anne who says they don't have any stock to ship out, and they don't know when they will have. She offers to cancel the order, and I wholeheartedly agree. Now I'm just waiting around to see if they'll still invoice me. With such bad customer service, I can't imagine this company being around long enough to deliver their product to me. Write a Review for Gotham Steel Knives!